The verse we can read on the label on Tamdhu ten years old describes the serenity of the Knockando burn before it is drawn into the Spey and surges over the famous Tamdhu rock which in times past was a hazard to the woodmen navigating rafts of timber to the sea. In 1863, this part of Highlands became accessible by the opening of a railway, what encouraged distilling along the upper Spey. With the increasing popularity of blended whisky in the early 1890s, wine and spirit merchants were attracted by the quality of Glenlivet style whisky to invest in new distilleries in the area. The moving force behind the construction of the Tamdhu distillery was William Grant, a director of Highland Distilleries. William Grant had appointed the most distinguished distillery engineer and architect of the time to design the new Tamdhu distillery. Indeed, William Grant and his partners with their extensive experience of whisky-making were determined that their new distillery should be as modern as possible. However, bringing the distillery into full production took time and patience. The distillation of a consistent quality “Glenlivet” style whisky was not the partner's only worry. By the end of 1897, they were deeply troubled by legal action threatening their right to take large quantities of water from wells and spring and burns, and preventing them from discharging effluent into the river Spey. At the end of the first season in June 1898, the directors of Highland Distilleries proposed a merger that was formally concluded on 1 September. Unfortunately, the perfection of this fine single malt coincided with a reversal in the fortunes of the industry. Output recovered strongly in 1920 and continued to climb until 1925. With the onset of the world depression sales dwindled and the distillery remained silent until after the Second World War. 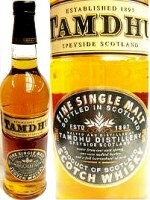 Tamdhu was launched as a single malt in 1976 as an eight year old whisky. At the same time a visitors centre was opened in the old Dalbeallie Station where tourists and representatives of the trade could learn more about the distiller's craft. Three years later the packaging was redesigned and the age rose to ten years in an effort to attract drinkers to this fine crisp Speyside whisky. The major part of the production from the Tamdhu Distillery is used in the blends Famous Grouse, J&B and Cutty Sark. NOTE: The Tamdhu Distillery was mothballed in March 2010. A good, light-to-medium Speyside malt, which is slightly peaty but with a delicate sweetness and a logn, subtle finish. Reasonably priced single malt and a great introduction to Scotch for the beginner. Nose: Rich, fruity character with floral notes. Palate: Spices initially - peppery with a toffee sweetness developing. Nose: Sweet and perfumed with a peaty/smoky note. Palate: Sherry notes with spicy elements and hints of dry grass. USA Customers: Click Here for a Full Selection of Tamdhu Single Malt Scotch Whisky! 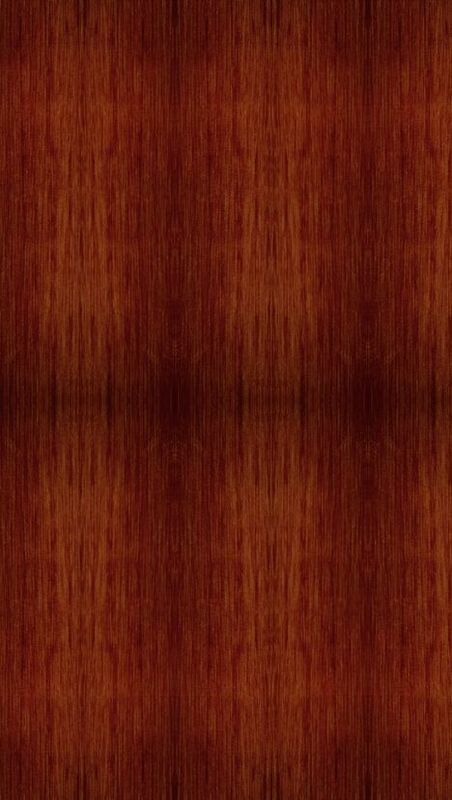 EUROPE/ASIA Customers: Click Here for a Full Selection of Tamdhu Single Malt Scotch Whisky! The Tamdhu Distillery was mothballed in March 2010. Proceed to Barley Intake We receive barley from grain merchants examples (Grain Farmers, Dundee) or (Highland Grain, Black Isle above Inverness). Barley received generally comes from eastern side of Scotland. We receive approximately 16-17 thousand tonnes of barley each year and usually we usually receive two 25 tonne lorries per day. When the lorry arrives on site it is weighed on weighing bridge and is sampled using sampling machine above weighing bridge known to us as ‘THE NODDING DONKEY’. These samples are then taken to Barley Office to be checked before unloading of barley. Each load comes with its on ‘Passport’ (necessary documents detailing variety of Barley, sampling results etc.). Barley varieties:- Cellar / Optic / Golden Promise. After checks have been carried out on load and load is accepted, it is then unloaded into the barley bins. Each bin can hold up to 100 tonnes of arley and smaller bins will hold up to 75 tonnes. We'll also see the malt bins which can hold up to 80 tonnes of malt with smaller bins holding up to 60 tonnes. Once the barley is off loaded, the Haulage lorry will then upload a load of malt. We feel it makes good sense to use lorries for off loading barley and then to load malt - which is then delivered to company sites. We will then proceed to barley office where we will explain its function and also what happens to the samples taken from load. First and last check of GERMINATION takes about 20 - 30 minutes. One hundred seeds (kernels) are halved and bathed in stain (colourless stain) before being set onto filter paper, the embryo in seed (kernel) has turned red this means the barley is viable (alive) but if it does not turn red then this means the barley is dead and is no good for a maltser and therefore load may be rejected (this is up to management decision). We are looking for germinative capacity of around 96 - 98% for germination (growing). We're looking for good quality. SCREENING: Screening checks are also carried out to check the quality of the barley. One hundred grams of seeds (kernels) are put onto the top tray of the machine and covered, the machine is then switched on (machine is shaken) and left for 5 minutes.The seeds (kernels) left on the 2.5 tray is the best quality barley; the seeds left on the 2.2 tray is known as good barley and anything left below is known as small barley siftings and dust and goes on to make feeding (animal feed) pellets. INSECTS: We also check barley load for insects such as grain weevils - we'll present a book showing types of unwanted insects and what damage they can do to barley seeds. If any insects are found in load the load is rejected immediately. We'll also show types of malting documents received with load as well as a sampling device known as 'sampling sphere' which will take samples from different levels in load, this is used manually if sampling machine (referred to previously as Nodding Donkey) is out of order. We will then proceed to see the process of barley to malt. The only ingredients are Barley, Water and Air and there are three stages: steeping, germination and kilning. From this point, we will move on to the steep room. You will be shown the control panel outside barley office which will let us know which bins are full or being filled. Steep Room Here we soak barley to break dormancy and start growth. We processs 44 tonnes of barley each day. We have eight steeps which each holds 11 tonnes of barley. You'll learn about the floor of steep - perforated panels which allows water in for steeping and piping around - piping which flows air into steep. These steeps are cleaned once a week and chemical cleaned every 2nd week. Water enters steep from the bottom and is filled up to line on side of steep, barley enters from top to meet water, also water is sprinkled into steep when barley is entering, this keeps down dust. The steeping process takes two days. First wet (steep) for 6 hours and then Air rest (drained) for 17 hours. Second wet for a further 6 hours and air rest for a further 4 hours. You'll see the barley prior to casting showing chitting. After steeping, it is then casted to saladin boxes which will then take us to the second stage in the malting process. From here, we'll move on to see the Saladin boxes and the germination process. GERMINATION: We control the application of warmth to the growing barley and to start to free the starch inside the barley seed (Kernel). During germination, the developing plant releases enzymes which will start to modify the starch. The complete conversion of the starch into sugar is at the Distillery by milling the malt and mashing it with hot water. Too much growth means less sugar and there will be nothing left for the Distiller. The germination process takes five days. This process is brought to an end by kilning. KILN: Kilinging involves stopping the growth by removing moisture / humidity. This process allows us to apply flavour in the form of peat smoke so that the whisky made will have a distinct flavour depending on how much peat smoke is applied. 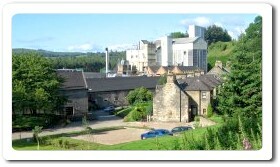 Kilning also preserves the malt. Once we leave the kiln, we'll proceed downstairs to see peat fire and we'll then arrive back in the yard. MILLING: Malt passes through two sets of rollers each roller weighing half a tonne each. It is crushed down to a powder we refer to as grist. This grinding down must be done with care and the rollers can be adjusted to give the required proportions of husk, grits and flour in the grind to give maximum extraction of sugars and to allow optimum drainage of the sweet wort which is the sugary liquid we take from the mashing process. Each grind is 10.6 tonnes which totals 160 tonnes a week. MASHING: Mashing involves taking the grist and our heated spring water and then deposited into a mashtun. We take forward 10.8 tonnes of grist and to this we add three infusions of water at varying temperatures. The objective is to extract as much of the sugars from the malt as we possibly can. We will take forward both first and second waters “worts” to the fermentation stage. The vessel is then filled from the top via the mashing machine, water and grist deposited together – the first water is heated to 64°C, second water to 78°C, and the third water will be in the 90s. Both first and second waters will provide enough sugar solution to take forward for fermentation. The third water contains very little sugar so we reserve this and use it to start off the next mashing cycle which for us makes the best use of our resources. The mashing takes approx 8 hours. During this time, we extract 53,500 litres wort from the mashtun via the underback which then passes through a plate heat exchanger which in turn preheats the water for the second and third waters. We then cool the wort down to 19°C as it travels on to the next stage called fermentation. Once completed, we have no further use at the distillery for the residual grist, now called draff which is sent to a dark grains plant where it is processed into pellets and used for cattle feed. FERMENTATION: We have a total of nine wooden washbacks made from Oregon Pine. We fill each wash back with 53,500 litres of worts and to this, we add 8 x 25kg bags of yeast. The next step involves filling the wash back - combining yeast and worts and let fermentation begin. The yeast loves sugar, it consumes the sugary liquid, and once the oxygen in the wort has been used up by the yeast the sugars are converted into alcohol and Co2. The bubbles you will see is the carbon dioxide gas being released. This part of the process takes in the region of 59 hours after which we have a beer type liquid referred to as wash which is in the region of 8-9% alcohol content. The wooden wash backs must be thoroughly cleaned after each fermentation firstly with high pressure cold water jets then steam is pumped into each vessel for an hour. DISTILLATION: For the distillation process, we will go to the still house which is where we improve the quality of alcohol by boiling in the copper pots. The Tamdhu Distiller has six copper pot stills. Each distillery has their own individual size and shape of still, which in turn will impart certain characteristics to their new make spirit. The pots with the window in them are for the first distillation. The window enables the Stillman to view the boiling liquid and alter heat to prevent the liquid boiling over. We pump 10,000 litres of wash into one of the large copper stills which is then heated by a steam. The alcohol water vapour passes through a shell and tube condenser, which is kept cool using cold water from the burn, which runs past the distillery. As distillation proceeds, the boiling temperature rises, the amount of spirit vapour becomes smaller and the amounts of water vapour greater. When there is only water left in the liquid, the wash distillation is stopped. The residue in the still is known as pot-ale which is despatched to the processing plant in Rothes. This will be mixed with draff (residue from the mashing) and used to process pellets for cattle feed. The safe here shows us the product from the wash distillation (small safe) – around 25% alcohol and you can see that it is quite clear. The distillate from the wash still - which we refer to as low wi nes will be in the region of 25% alcohol. The low wines are now transferred to spirit stills. This is where 12,000 litres of low wines are charged to each still in this area where we repeat the distillation process. This process concentrates the levels of alcohol and allows us to select the middle part of the second distillation or the heart of the run, which has the best quality alcohol between 75% - 66%. It is this “middle-cut” we take forward as spirit for maturation. The first and last fractions from the second distillation – foreshots and feints are then distilled once again with the low wines produced from the wash distillation. These low wines then go forward to the spirit distillation. The receptacles in this safe (large safe) are for “spirit” and “feints”, spirit being the heart or middle of the run and feints the first and last part of the spirit distillation and is on it way to the spirit stills again. The handles on top of the spirit safe allow the flow of liquid to be directed to either of the receiving jars. The new make spirit we have produced will now be collected in the inter spirit receiver before being transferred to the spirit receiver warehouse vat. FILLING STORE: The spirit then will now head in two directions. To the right hand side to tankers for new make spirit. Excellent quality new spirit for the blending industry – Chivas, Diageo and Ballantines are also customers. To the left hand side for filling to our own casks for maturing here on Speyside. NOTES: The maltings were modernised in 1949 / 1950. The first malting came off the kiln in November of 1950. In 1966, the doubling of the malting capacity was achieved. If time is money you&#039;ve made me a welatiher woman. Note that Knockandu (cnocan dubh in Gealic) and Tamdhu (tom dhubh in Gaelic) have the same meaning.